As cobbled together as the full title suggests, Thomas & Friends features the well-known tank engine familiar from the Reverend W Awdry's books. This feature-length special is based on Britt Allcroft's spin-off TV series, satisfying the insatiable appetite of toddlers for cheap CGI and trains with sinister rubbery faces. A new character, seemingly based on Lightning McQueen from Pixar's Cars franchise, is the chief innovation here. Voiced by singer and reality star Peter Andre, Ace is a free spirit racing car who encourages Thomas (John Hasler) to leave Sodor and see the world. Thomas leaps at the chance to visit five continents, but his aspirations to race with Ace are dashed, and instead he finds a potentially romantic friendship with engine Nia (Yvonne Grundy). Thomas's adventures hardly need to be intense to attract their target audience, but the story featured in director David Stoten's film will exasperate anyone over the age of five. The bland, episodic structure pauses for shallow local colour as Thomas passes through Africa, South America, North America, Asia and Europe. As if this wasn't enough of an ordeal for parents, Andre has contributed his own composition 'Free and Easy' to a stream of awful songs which slow the fractured narrative to the speed of a broken traction engine. Somehow the willingness within the children's film market to sustain features about Thomas the Tank Engine seems to have inspired regular cash-ins rather than any serious filmmaking that might take the beloved character to another level, à la Paddington. The result is an impersonal slice of television that feels out of place on the big screen. Children who can handle the likes of Inside Out or Incredibles 2 will find Big World! Big Adventures! to be strictly for tiny tots. General release from Fri 20 Jul. 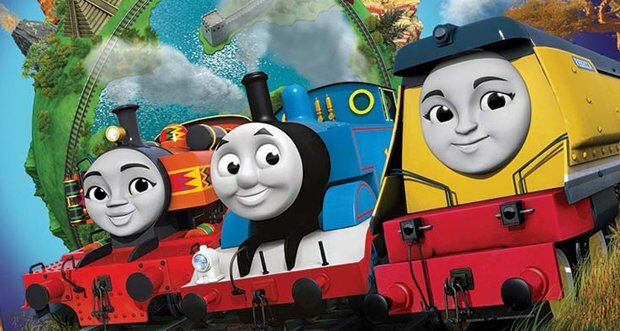 Thomas the Tank Engine (voiced by Hasler) heads on a global adventure, encouraged by a free-spirited race car (Andre) and a potential romance with engine Nia (Grundy). A bland, impersonal plot will fail to entertain anyone except the tiniest of tots.